The New Year is often a time for people to reflect and make resolutions. Some reflect and wish they would have sold their equities in September. Others make resolutions never to buy bitcoin or cannabis stocks again. The fourth quarter reminded everyone participating in the equity market that after many ups, there will be some downs and to enjoy the benefits of the ride you have to deal with both. 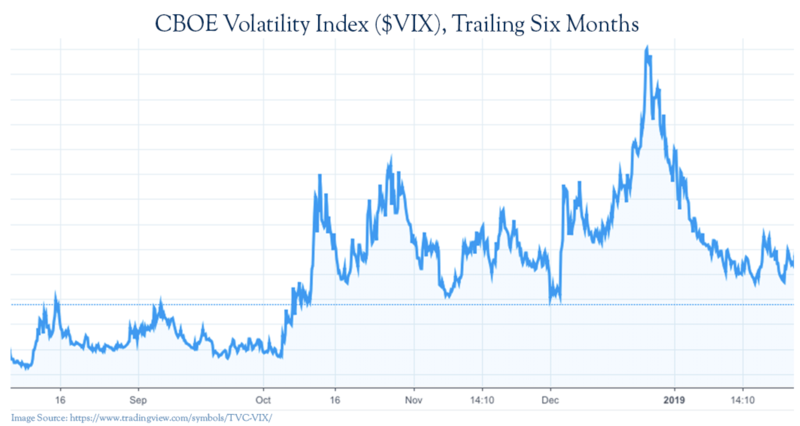 Volatility, which has been low for so many years, reared its head high in 2018. Nearly all asset classes had negative returns through November and domestic and international stocks stayed that way. Bond investors saw rates drop and treasuries rally in December, helping generate slight positive returns for the year if they avoided long maturities and low credit quality. Like most of you, we are uncomfortable with what happened in the fourth quarter. Yet, trying to sort through it all is like trying to put together that 3,000-piece jigsaw puzzle you received for Christmas. Also, like that jigsaw puzzle, it will take time for the dust to settle, the markets to sort out overblown reactions from facts, and for investors to erase this from their mind. 2018 will go down as the first negative calendar year for the S&P 500 Index since the financial crisis in 2008. In the seven trading days before Christmas, the S&P 500 Index was down over 11%. In the eleven trading days after Christmas, the same index was up over 10%. Recovering a part of the fourth quarter losses is a good thing, but so far, it only fits into the bounce category, not the recovery category. Most indexes have recovered about 50% of the peak to trough decline from late September through late December. The good news is that the volatile market has brought valuations down to more reasonable levels. Although earnings growth will slow from 2018 levels, growth is still expected to continue. In the past, when the market multiple has fallen 5X (from about 20X to 15X this time) the subsequent twelve-month return from the bottom has averaged slightly over 20%. Selling or reducing equities at the bottom is not a good long-term strategy. Our portfolio management team has taken this opportunity to make some adjustments to our portfolios while maintaining a high-quality bias to our holdings. As always, downside risk management continues to be a focal point of our investment process. Sometimes, investing may seem easy. In periods of rapid change, it can seem frustrating or impossible. We accept the challenge of difficult periods, and we have faced our share of them over the last four decades. We learn from every experience, and our accumulated experiences are guiding us through the current market challenges.